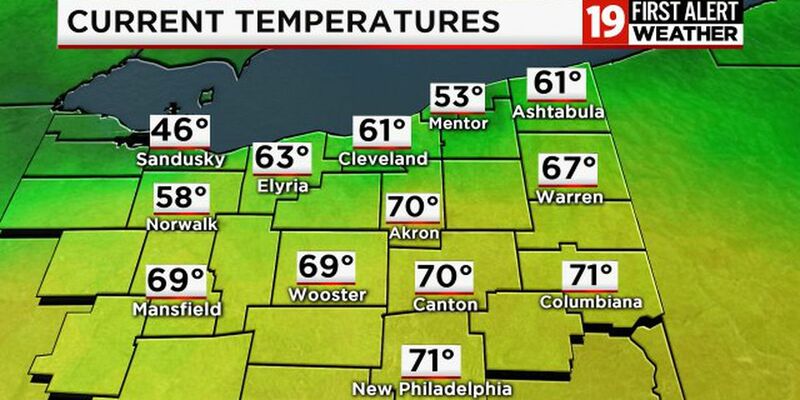 CLEVELAND, OH (WOIO) - A warm front will continue to lift north through the area Wednesday evening. Temperatures will stay mild overnight in the 60s! It's 57° at Hopkins right now but only 49° at Burke Lakefront with fog still being reported! We'll have spotty shower chances to start the day Thursday. Depending on who sees a drop or two in the morning, we'll see some of the warmest temperatures of the year so far tomorrow! Highs will top out near 80°! Rain and thunderstorms will arrive along a cold front Thursday evening. We're not expecting severe weather through the end of the work week, but some areas will see significant rain which could cause flooding in some spots. We'll see another system move in heading towards the start of the weekend, keeping scattered rain in the forecast for Friday and Saturday, especially in the morning. Friday and Saturday will also be A LOT cooler - Highs will only be in the low 50s both days. Easter Sunday we should see a break in the rain by the afternoon! More good news - we will be warmer! Highs will be in the mid to upper 60s. 60s and showers will be the theme through the start of the work week.